The incidental capture and mortality of non-target marine animals during fishing is known as bycatch, and is one of the principal threats to marine biodiversity worldwide. Much of the fishing industry targets specific species for capture. Unfortunately, other animals become hooked or trapped when attracted to the bait or target catch, or are simply unable to avoid capture or entanglement in fishing gear. One of the most widely publicized examples of bycatch occurred during the 1970s, when thousands of dolphins perished in tuna purse seine nets in the Pacific. Although solutions have since been implemented, bycatch is still a widespread problem in all fisheries and in all seas, sparing no group of animals—from delicate corals to massive whales. Some would argue that bycatch is an acceptable consequence of supplying the world with wild-caught seafood. However, too often the scale of mortality is so high that it threatens the very survival of species and their environments. Every year, at least 7.3 million tons of marine life are caught incidentally. In some fisheries, the percentage of bycatch far outweighs the amount of target catch. For example, for every shrimp caught by nets dragged behind trawls in the Gulf of Mexico, over four times its weight is bycatch. 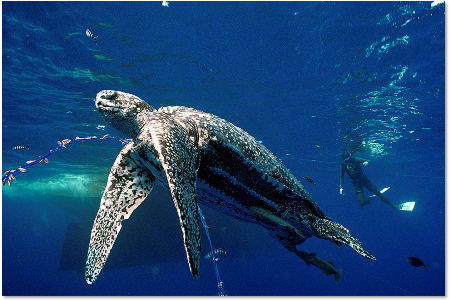 There are many cases illustrating the devastating impact of bycatch. In 2007, the world learned that the baiji, a freshwater porpoise found only in China’s Yangtze River, finally succumbed to decades of incidental hooking (among other causes of mortality) and is now believed to be extinct. In Mexico’s Gulf of California, the population of another porpoise known as the vaquita has been reduced to just several hundred animals, and gillnets continue to entangle and kill many every year. In the Northwest Atlantic, Canada and the US are working to ensure that the North Atlantic right whale, now numbering over 400 individuals, does not perish from fatal entanglements in fishing lines. These are not rare examples, but part of a systemic problem worldwide. Bycatch also takes a serious toll on fishermen. It results in damaged gear, reduced catches, and fishing restrictions that threaten their economic survival. The good news is that there are solutions to the threat that bycatch poses to endangered species. One approach is to reduce fishing or direct it away from hotspots of conflict between fishing operations and non-target animals. There are also fishing technologies and methods that keep the fishing industry active but that reduce bycatch to levels at which it no longer poses a threat to the survival of non-target species. The challenge is to identify the most practical solutions in collaboration with the fishing industry. Bycatch is the most serious issue threatening the smalltooth sawfish today (Seitz & Poulakis 2006; NMFS 2009).